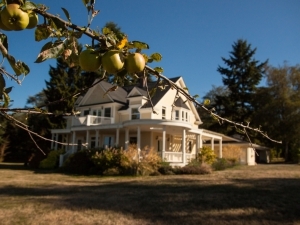 Marty’s Place has 4.5 acres of pastoral beauty with expansive views of Saratoga Passage, Camano Island and Mount Baker. 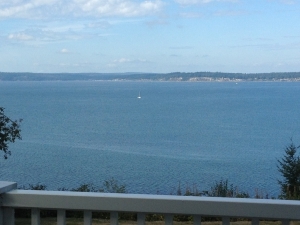 We are located on a high bluff above the water. 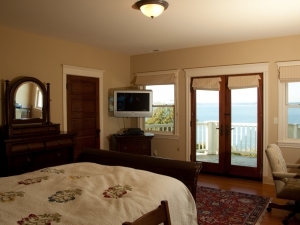 Master Whidbey’s Bedroom is our master suite and the most luxurious bedroom in our house. It has a private balcony with a view of the grounds and the water beyond. Love cooking? Marty’s Place is for you. 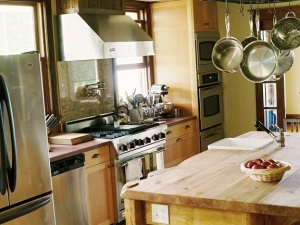 We have a gourmet kitchen with a wooden island to prepare your food, two ovens, two dishwashers, two sinks and all the pots and pans you will need to make magnificent meals for your family. We have beautiful, pastoral views of the garden, the corral or the water from all of the bedrooms and other rooms in the house. 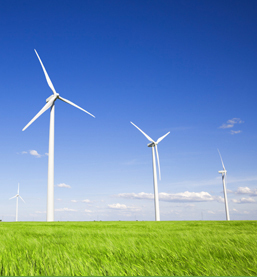 You can see always our our beautiful grounds or the stunning view. 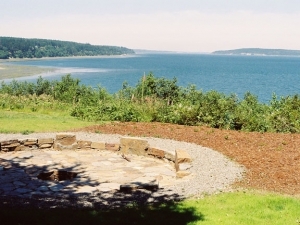 Enjoy our stone firepit on the bluff overlooking the water. If it is too cold to use the firepit, you can relax around the fireplace in the living room and still enjoy the view through our panoramic windows. 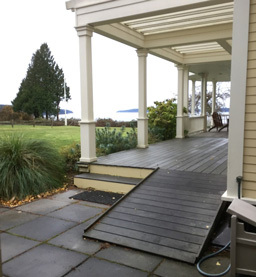 Our large wraparound porch is the perfect place to relax and enjoy the view. 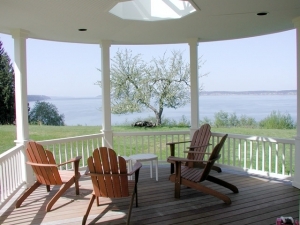 Sitting in the chairs under the skylight, you can look out over the lawn to the water, Camano Island and Mt. Baker. 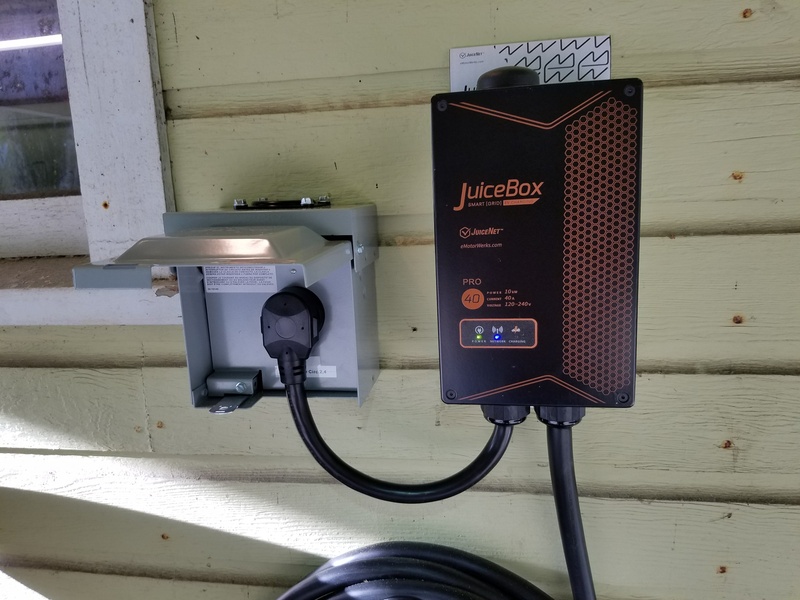 Did you know that you can visit Langley, WA and stay at Marty’s Place at Strawbridge Farm with your electric car? Do you play the piano? 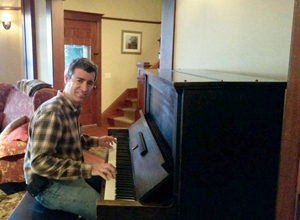 Marty’s Place has an antique upright Steinway piano made in 1930. 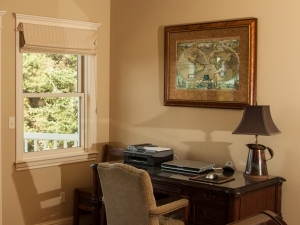 You can play for your family in the living room in front of the fire while looking out over our beautiful view. We know how hard it is to leave your pets at home, so your dogs and cats are welcome at Marty’s Place with prior approval. 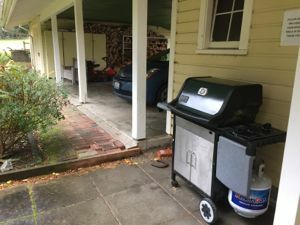 Marty’s Place has a propane BBQ grill adjacent to the garden for our guests to use. 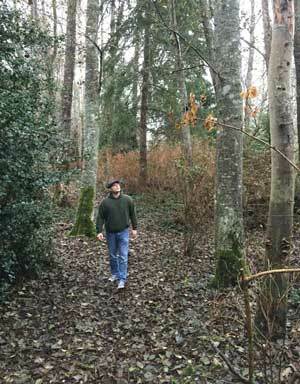 We have a short trail through the woods at Marty’s Place. As you walk along the path, surrounded by tall trees, you will encounter some surprises along the way. 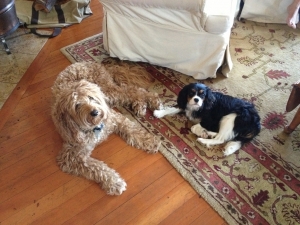 The downstairs of our house is accessible to those with limited mobility. The ground floor can be reached by a wide ramp from the driveway, and all of the downstairs rooms, including the full bathroom, can accommodate wheelchairs. House through the Apple Tree, “Luxury Master Suite with Private Bath” and “Entertainment, Internet and Home Office” photos Copyright © 2014 by RA Stine.